On a Benelux Cruise through Belgium, the Netherlands and Luxembourg you will enjoy river landscapes of great diversity, historic Hanseatic cities and wonderful natural life. This flat land is criss-crossed by numerous canals. 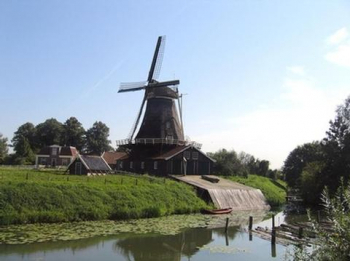 The more than 8000 km of waterways will take you past tulip fields, old windmills and little villages. The three states of Belgium, the Netherlands and Luxembourg have since 1944 been part of a customs union. They lie on the west coast of Europe and are still closely connected today by virtue of their political co-operation. The best time for a Benelux Cruise is between April and September. The defining feature of this cruise is the old culture of Belgium and the Netherlands which you will see everywhere you go. For example, you will experience the works of old masters such as Rembrandt or Rubens in the breathtaking gallery in Bruges. Or you can allow yourself to be transported back in time by a visit to the centre of Brussels, with its medieval influences, old churches and guild halls, which lend the city a quite particular flair. The hustle and bustle of business in the cities stands in sharp contrast to the charming villages which are dotted about the whole region, where life is lived at a more sedate pace, allowing such villages to become oases of peace. It is here that you will be able to relax completely or enjoy an excursion into the beauties of nature. Experience Brussels, with its colourful history - city of culture and home to the European Parliament, the world metropolis of Amsterdam with its canals and Europe&apos;s largest seaport, Rotterdam. You will pass the mighty Rhine, the Maas, the Schelde with the seaport of Antwerp, and Lake Ijssel on your journey through the Benelux states. By the way, it isn&apos;t just great river trips which are waiting for you, but also fabulous cruise routes on the North Sea to the Dutch islands of Texel, Terschelling or Ameland. Your Benelux River Cruise will stand out out not just because of its wealth of world-famous artistic and architectural treasures, but also because of an experience of nature from the water which is perfect for rest and recuperation. An incomparable cruise full of harmony awaits you!